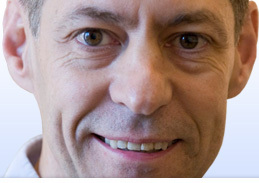 English - Kjeld Søballe, professor, overlæge, dr.med. In patients with hip dysplasia, the hip socket is underdeveloped and therefore does not cover the femoral head correctly. As a consequence most people with hip dysplasia will develop osteoarthritis in the joint over time. Early symptoms of hip dysplasia are tiredness/fatigue around the hip area and inability to walk long distances. Ganz osteotomy is a surgical treatment for acetabular dysplasia that preserves and enhances the patient's own hip joint rather than replacing it with an artificial part. The goal is to alleviate the patient's pain, restore function, and maximize the functional life of their dysplastic hip. 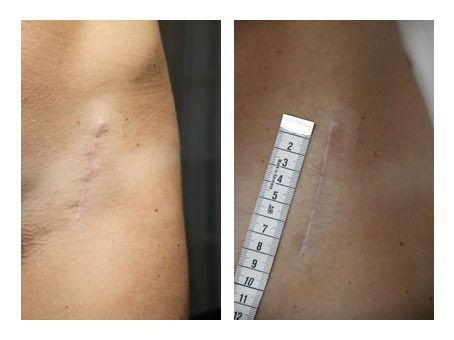 Ganz operation used to be considered an extensive operation requiring cuts through tendens and muscles, Professor Kjeld Søballe has, however, developed a new operation method, minimally invasive technique, performed through a 7 to 9 cm cut in the skin without cutting through tendons and muscles. To learn more about minimally invasive Ganz operation, please read this article and view the video below. Also, please read this Patient Information describing the pre- and post-operative procedures of hip dysplasia correction. 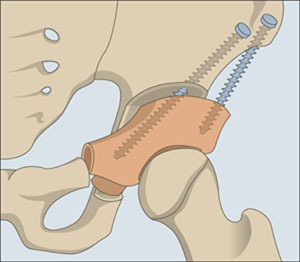 Kjeld Søballe has developed a minimal invasive operation technique allowing him to perform the hip surgery through a small incision (seven cm compared to normally 20-30 cm). The advantages of this technique are less blood loss, shorter duration of operation, fewer traumas to the surrounding tissues and shorter hospital stays. Patients usually have less pain compared with traditional surgery, and rehabilitation is faster. Pictures of left groin with a 7 centimeter scar after Ganz operation for hip dysplasia.